Daily fantasy baseball has started out for me like regular fantasy baseball – cold as ice. It’s nothing new, really, as a lot of big names struggle out of the gate and once they get through April its back to normal. No need to hit the panic button, yet. While I haven’t been great in baseball, my UFC picks have been killing it. If you are unaware, check out GamingToday.com every Saturday to see my column. This weekend’s story will be on the UFC 186 PPV card. Back to baseball, it’s tough to make calls a day ahead not knowing if anyone is getting a day off. With that said, look at the announced lineups from the team managers before signing off on your team. Weather is also a factor and unlike being stuck with a betting slip, it’s much easier to login to your fantasy website and make changes. It’s important when selecting your players to keep an eye on the top news surrounding each team, I can’t preach about Rotoworld.com enough. It’s a fantasy site that collects information from sources all over the sports world. Sometimes when an injury hits a team, it’s a spot for a low salaried fantasy player to step up. Paying attention to the latest news can give you a cheap option and allows extra fantasy cash to plug another star into your daily lineup. 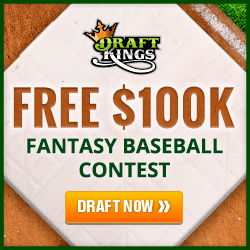 DraftKings is currently offering a $27 entry game, “MLB $1 Million Mega Payoff Pitch,” first place gets $100,000. That doesn’t start until May 26. For the brave, there is a $300 entry game, “MLB $1 Million Home Run;” top prize is the same, $100,000, with almost 40,000 fewer entrants. Giancarlo Stanton, OF, Mia ($5,400) – Stanton was a beast last year before getting hit by a pitch in the face last September. He is off to a slow start but against the Phillies pitcher Jerome Williams he should crush at least one home run. At the price he’s a great bargain. Projection: 2-5, HR, 3RBI. Jimmy Paredes, 3B/OF, Bal ($2,000) – Paredes has been getting a chance to shine after coming off the DL. He is 5-for-10 to start the season. Projection: 2-4, RBI. Stephen Vogt, 1B/C, Oak ($3,600) – Vogt has been red hot with the bat, starting the year at .368 in 42 at bats. Averaging 10.2 on DraftKings thus far, it’s worth giving him a shot at catcher or even if you need a cheaper option at 1B. Projection: 3-5, HR, Double, 2RBI.